Coffee beans, powder or compatible capsules, for mocha and espresso: buy our blends online, and enjoy the unmistakable aroma and fragrance of Caffè Fiorella, a family history for over thirty years. Caffè Fiorella spedisce la tua miscela preferita in tutto il mondo. Our roasting activity is located in Siena, one of the most beautiful and renowned Tuscan cities, where for over 30 years we produce our coffee with passion with a totally artisanal and 100% natural method. All our coffees come from a careful selection of raw materials, an artisan roasting and an experience of generations that allows us to anticipate the tastes of our customers. Fiorella, the founder of Caffè Fiorella, has passed on the passion and experience to her son Francesco, who today carries on the family business by taking care of the roasting activity. Our logo, created and designed in collaboration with Leonardo Scarfó, designer and art consultant, tells the story of our family and our business. Sinuous and dynamic lines reminiscent of Art Nouveau blend into the blue of the sea crossed by a boat - symbols of Follonica and Castiglione della Pescaia, our places of origin - to make up the profile of Siena, with the Torre del Mangia and the Duomo, our second and current home, where we decided to settle and enlarge our business. 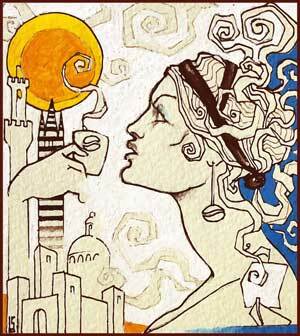 At the center there is the profile of a woman: it is the emblem of the women of Caffè Fiorella. Finally, the cup and the coffee bean, the fulcrum of our work and our passion: to give you the emotion of an excellent coffee. Buy our coffee blends online: Arabica, Robusta, Fiorella, Monorigine, decaffeinated, in the desired quantity and format. Aroma and perfume will arrive intact at home thanks to the vacuum packaging that preserves the taste and fragrance of our coffee. We also supply coffee for bars and restaurants. For orders over 10kg, please contact us directly! Life is a beautiful and endless journey in search of the perfect cup of coffee.